Boris Johnson has admitted he decided London should not host the start of the 2017 Tour de France because it was "not worth it". The London mayor told BBC London 94.9 he could not justify spending £35m on a one-off event. He said: "I will not waste cycling money on something that would only deliver very brief benefits." Transport for London (TfL) pulled out a day before the contracts were due to be signed. Amaury Sport Organisation (ASO), the French company which owns the race, was told of TfL's decision last week. Mr Johnson said: "I'm afraid I have got to put my hands up here and say I took the decision not to go forward with it. "You've got to take some tough decisions in government and I think 35m quid on a one-off event was just not worth it for London." He said the money could be spent on long-term infrastructure to make cycling in London safer. Last week, Leon Daniels, managing director of surface transport at TfL, said: "To ensure value for money we must make difficult choices, and on this occasion we have decided that we will not be hosting the Grand Depart in 2017." TfL would have provided the funds for holding the Tour's opening stages. 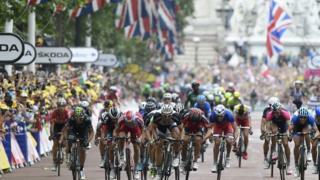 In 2014 TfL paid £6m to host the finish of the Tour's third stage. London also hosted the Grand Depart in 2007. Labour's candidate for London mayor, Sadiq Khan, said the Government had "wasted a huge opportunity". In 2014 the Tour was watched by crowds totalling 4.8m people in the UK and generated around £128m, according to a report published last year. Spectators gathered in Yorkshire on the weekend of 5 and 6 July as the riders went from Leeds to Harrogate, and then from York to Sheffield. The report, "Three Inspirational Days", said a quarter of everyone living in the Yorkshire and Humber region came out to watch and the Tour attracted 113,000 visitors from outside the UK, generating £33m into the UK economy. It also found the 2014 event generated more than £128m of economic benefit for the host areas overall, with £19.5 million being generated for London.